In 2006, England didn’t have the best start to their winter tour of India, it started with a catalogue of mishaps: Kevin Pietersen, the lead of their batting line, and doughty Paul Collingwood both had back problems. While Simon Jones, the fast bowler, had missed the only side game of the tour due to a stomach bug. Marcus Trescothick flew back to home after the conclusion of the side game, citing personal reasons. Michael Vaughan, the captain of the side, failed the fitness test and was ruled out of the first Test. Consequently, Andrew Flintoff had to step in as captain in the absence of vice-caption Marcus Trescothick. These events prompted English selectors, on 24th February 2006, to include, a 21 years old lithe man in the touring team. The man was part of ECB National Academy side touring West Indies. He took the first available flight to India, reaching Nagpur (the venue of the Test) on the eve of the match. The cricketing world saw Alastair Cook for the first time. From the start, he impressed one and all; scoring 60 in the first innings and 104 not out in the second innings. Considering the backdrop and circumstance that unfolded prior to his debut, he made an exceptional start, a testimony to his mental strength. After that, he never looked back. The man, blessed with the looks of a supermodel, was always mild-mannered, quiet and taciturn on the field. He was a picture of concentration, an enormous accumulator of runs and a safe slip fielder on the cricketing field. His batting reflected his personality: it lacked the flamboyancy of Sehwag, pugnacity of Langer or, for that matter, the certitude of his teammate Andrew Strauss. Tenacity is a great attribute and he had it in abundance- both in his personality, as well in his batting. As he faced the press before his swansong at the Oval, there was a glint of satisfaction in his eyes, like a mountaineer has in his eyes after climbing a mountain. “I have had to work so hard for every single run, I have ever scored, I just wouldn’t miss being on that edge, and that’s probably a sign its right time to go in my eyes,” he answered, lowering his eyes, to the media on a question about retirement decision. He reflected upon his moments on the cricketing field: high point being winning the Ashes down under in 2010-11, where he amassed a record 766 runs, and Test series win on Indian soil in 2012 tops the list. He also acknowledged that Kevin Pietersen infamous saga could have been handled differently and felt he was made a scapegoat. “And as a captain of the side, certain stuff is made above your head and it was tough time” he added. 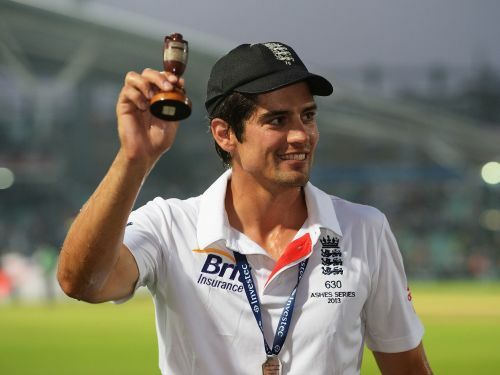 Cook is finishing his Test career as the highest run scorer for England and sixth highest in the all-time highest run-scorers list. His services will be missed in the Test cricket, and most certainly by the English side. In this fast modern age, we hardly talk of virtues like tenacity and grit, if we ever do the name that will certainly top the list is Alastair Cook.